Sometimes for a bit of fun (or in times when I need guidance), I indulge my interest in the worlds unknown by laying out a Tarot spread. I also do this for friends and family, so why not the interwebz? Tarot holds no answers - not the kind you're probably thinking about, anyway. Tarot is the "book of life". It's not about telling the future; rather, it is about considering it. The cards guide by making us question ourselves, our motivations and our dreams. 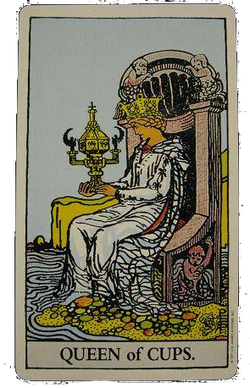 I am the Queen of Cups, or so the deck keeps saying. It could be coincidence that the card keeps turning up, but I'm just going to go with it. On the matter of coincidence... even if that is the only driving force behind the spread, has it not achieved its goal by making you consider the problem that you are seeking an answer to? I do not believe 100% in Tarot. Often, it is just for a laugh. I use a Rider Waite deck to conduct my readings, relying heavily upon the book The Tarot Revealed by Paul Fenton-Smith. I am learning to listen more to my inner voice and any sensations that occur to me, so we'll see how much of the book I need in the future. My current deck came to me in strange circumstances. I had been searching for a Rider Waite on the internet for a very long time, but they were either missing cards or too expensive. One day, I walked into a book shop where they usually lock up such things in a cabinet. Lying on the shelf, by itself, was a Rider Waite deck. All of the other types were indeed locked away. On that day, I also had a coupon which saved me a few bucks off the price. Fate? I'd like to think so, but things are never certain. So what do you have to lose? Have a bit of fun! It may take up to 31 days for me to respond, given what I have going on in my Real Life (omg, what's that?). I take no responsibility for what you do with your reading. - "Very trippy Caz, doing my head in"
- "I need you bad madam Kaz!" - "That's not bad at all, given how vague my question was." - "Exactly what I predicted!" - "Surprisingly, some very good points to consider."